You remember how I played a few Shadowrun Returns campaigns, and thought they were interesting but rather rough? I may have thought, "Oh, I bet I could do something like that." And I did! I whipped up a little module called Antumbra, and tossed it onto the Workshop, and... it's been a really gratifying experience. Fun to work on, and rewarding to hear from people who've played it and enjoyed it. It felt surprisingly great to get back into modding again. As I was working on Antumbra, I realized that it's been a long time since I've built anything for another game. I think the last serious modding I did was for Civilization 2, back in the mid-to-late 90s. Actually, Civilization was also the first franchise I modded. The original Civilization was one of my favorite games. One day, when I was bored and nerdy, I started opening random files in my computer to see what they looked like. (This was one of the nerdier thing I'd done up to that point, but would pale in comparison to the moment in college when I realized that I could pipe arbitrary files to /dev/dsp in order to find out how they sounded.) Most were gibberish, but I was surprised to see that several of the files for Civilization were viewable in plain text. I recognized some of the statements that other leaders would say during negotiations, a few messages that would pop up on the screen, and so on. I carefully made a copy of the entire game (which was quite a hit to my 40 megabyte hard drive), and then started editing the files and saving them. I was elated to discover that it worked - I could change some text, then play the game, and immediately see my own words coming back to me from within the game! Wow, how cool! I embarked on my major project: to align the game's cosmology with the Biblical creation story. I carefully edited the text for the opening movie, replacing its description of a five-billion-year-old Earth and a long process of evolution with text from Genesis 1, synchronizing each step of the creation story with the pre-existing graphics. I felt inordinately proud of myself for striking a blow against secular humanism, and reframing the context of the game into a more palatable mode. When people asked me what my favorite computer game was, I used to tell them, "The original Civilization is the greatest game to ever have been created in the entire history of mankind, and Civilization 2 is even better." Along with the numerous other improvements of the sequel, it was also a bonanza for the nascent modding scene. As with its predecessor, many files shipped in a user-editable version. I was really impressed to see that this was even true of the graphics - a single image file contained frames for each of the different units, so if, for example, you wanted a giant space monster in your game, you could copy over one of the existing units with your new picture, and then it would show up in all future games. Civ 2 also introduced the idea of a "scenario": a special game mode that used the existing engine, but played out differently than the usual epic 4000-BC-to-2000-AD experience. Each scenario had a unique map (usually on a flat map representing a particular geographic region), large pre-existing civilizations with their own cities and armies, and unique victory conditions. The original Civ 2 shipped with two scenarios: The Rise of Rome, a classical-era game with a fledgling Roman Republic arising in the post-partition Greek world; and World War II, an awesome simulation of the European theater that starts at the moment of the invasion of France. I think MicroProse figured out that there were a lot of people like me that enjoyed tinkering with their game, because soon after came an expansion titled "Civilization 2: Scenarios". This didn't make any major changes to the core game; instead, it added a slew of new interesting scenarios. There were some more historic ones, like the American Civil War (a focused battle) and the Age of Discovery (a more open-ended experience); some alternate-history ones, like a World War III set in 1979; and my personal favorites, two dystopic sci-fi scenarios, one set in a frighteningly difficult alien invasion of Earth, and the other set in a post-apocalyptic Road Warrior-esque future. The real prize for me, though, was that this expansion shipped with its very own scenario creator. You could build your own unique map and create custom civilizations and units, bundle them into a new scenario (instead of needing to overwrite your core files), and use a simple scripting language to turn it into a real game. You could create special events, enforce victory conditions, programatically spawn units, enforce diplomatic states... the possibilities seemed limitless! I spent a lot of time building an enormous and elaborately detailed map of Middle-earth (using the expanded Iron Crown Enterprises map that included the lands east and south of Mordor). Once that was done, I started creating a Bereliand map for a scenario set in the First Age. I got excited when I figured out how to achieve certain fictional effects by using my available tools in unexpected ways, such as creating the Girdle of Melian by making a bunch of invisible units, setting their type to Bomber (so land-based units couldn't attack them), and then setting their movement rate to 0. Now Doriath could wait secure until the time had come to marshal their forces and march into battle. I then set myself to a more ambitious project, creating a more open-ended scenario that was set in Midkemia after the Ringwar Saga. I'd enjoyed Raymond Feist's early books, but disliked the Serpentwar Saga, so I decided to try and create my own version. I set up the scene as it was right before the latter Saga, with Arutha ruling Krondor and an enormous armada invading from the west. Several other independent nations were in the mix, and it was really fun and interesting to see all the different ways that the conflict could play out. Once again, I got just as much pleasure from figuring out how to accomplish certain effects, such as creating winter storms that would arise in the Bitter Sea, traveling randomly and damaging ships they encountered, only to vanish after the seasons turned. So, yeah. I had a ton of fun. Modding seemed very different in those days: I didn't have an Internet connection to speak of, and no access to the nascent modding communities, so it was purely something I would do for fun; in the best case, if I really liked something I'd made, I would share it with a few real-life friends who also enjoyed Civilization, but that was about it. Around the time I went to college I started getting more Internet access, and was stunned at the originality and creativity of other modders. And not just for Civilization, either: games that I would have thought were un-moddable, like Half/Life, had entire conversions available to them like Counter Strike, adding entire new 3D models and completely changing the style of the game. This was a wonderful trend for me as a gamer, but a disturbing one for me as a wannabe-modder. As modern games got more complex, the skill requirements for making a good mod grew steeper. There's a huge difference between editing a cartoony 32x32 pixel block in a GIF file, and building an entire new wireframe mesh from scratch. Over time I became very accustomed to grabbing the best mods for any new game I got (which is a large part of the reason why I continue to play RPGs exclusively on my PC), but I gave up any hope of modding myself; the most I would ever do was make some edits to an existing mod made by someone else. In retrospect, I missed a very obvious solution: work with other people. I know, what a crazy concept! There are lots of talented artists out there, and there could have been some fruitful partnerships with someone else producing the art, and me doing some combination of map creation, scripting, and dialogue writing. I'm not sure why that never occurred to me. Maybe because I'd always thought of my modding as a solitary activity, or because I was afraid of letting other people down if my part of a project wasn't up to snuff. Anyways. Honestly, I haven't thought about making mods for many years now, but that was all rekindled recently with the Shadowrun Returns kickstarter. Pretty early on, the guys at Harebrained Schemes decided that they wanted to put their effort into making a really good editor: the game wouldn't just be about one story they're telling, but them creating the world and giving us the tools to create our own stories. Now, that sounds cool! It seemed perfect for someone like me: I'd be getting a package with a ton of unique character portraits, customizable 3D character models, and a wide array of elements for constructing maps. It seemed like my weakest spots were covered, and I could focus on the stuff that excited me the most. Certain high-level donors got early access to the editor and a head start on making mods. I didn't have that access, but did pay a bit of attention to the information released about the editor. I started idly thinking about a certain scenario, and jotted down a rough synopsis and several scenes of dialogue. When the game was actually released, I... totally ignored the editor and just immersed myself in Dead Man's Switch for several days. I'm glad that I did. The final game was different in several small-but-important ways from what I was expecting: it was more linear and less sandbox-y than the SNES or Genesis games. I discovered, though, that I loved the streamlined feel. As I've grown older, I'm increasingly appreciative of games that focus on your character constantly doing cool, interesting stuff, and removing the padding that surrounds major encounters. My original inspiration was one of the most vivid memories of my life as a gamer. As a young teen, my family didn't own an SNES, but a junior-high friend of mine did, and I would sometimes go over to his house to play. One of my favorite games of his was Shadowrun. It was my first-ever exposure to cyberpunk, my first exposure to futuristic fantasy, and one of the only dystopic sci-fi settings I'd encountered yet. My little nerd brain was totally blown. By far the memory that stuck with me most strongly is your entry into The Cage. For much of the game, The Cage taunts you: it's a cool-looking club, and you can hear some neat 16-bit music playing when you enter, but an enormous Troll bouncer blocks your way. In typical adventure game fashion, he demands a Ticket for entry, so you'll need to find that item to proceed. This takes a long time, and so I was left wondering what lay beyond him. At last, I found the Ticket, returned to the club, and handed it to the troll. He grunted and stepped aside. I ran forward. The music grew louder. I saw other people in the room, dancing wildly. And, then, I saw her. Maria Mercurial herself. Posed triumphantly at the front of the stage, belting out her song into the microphone, while strobe lights flashed all around her and her band rocked out behind her. I was floored. I'd never seen (or heard!) anything remotely like it in a video game before. So, yeah. When I thought about creating my own shadowrun, that experience instantly leaped into my mind. I wanted to pay homage to it, and also use it as a jumping-off point for a story of my own. So: I would need a nightclub, obviously. Shadowrun has a very rich and detailed lore, including a whole spectrum of clubs from the very seedy to the very trendy. I was a bit hesitant to borrow one of the existing locations like Penumbra or Dante's Inferno: it's hard to do justice to the versions people have created in their own minds. So, I decided, I would create a new club. And that became the kernel for the plot: yes, this would be a new club. So, it would be an implicit competitor to the existing clubs, and they might be hostile towards it. Land in downtown Seattle is hotly contested, so a new club might need to open closer to the fringes of the Sprawl. I did some research and decided that Everett was a good candidate: it was fairly far away from downtown, and was a poor-but-improving region that fits the profile of a gentrifying neighborhood that could attract a new place like this. This post isn't nearly long enough yet! I feel like pompously meditating on the act of creativity. It's no secret that I became a programmer because I wanted to make games. My very first experiences with BASIC at the keyboard of an 8088 IBM PC were spent recreating the text adventures that I loved playing. I've known for a long time that I wouldn't want to work in today's gaming industry, but the temptation of making my own games kept me motivated through the long process of learning how to program. I am FAR from unique in this; most of the male programmers I know have similar stories. And it isn't just programmers, either. Practically any gamer you talk with has a few ideas for their own games. Maybe a side-story set in a franchise that they like, or a wholly original concept. Some use their imaginary game as a playground for telling elaborate stories, and others want to wow people with drastic gameplay innovations. So, if there are approximately 10 billion game ideas out there, how come only a tiny fraction of those ever get made? Well, because making a game is hard. Coming up with an idea feels special, because it's the idea that we remember most when we think about the great games. (Final Fantasy VII: "Futuristic fantasy, Jenova, Sephiroth, fake Cloud." GTA San Andreas: "CJ transcends revenge and builds an empire." Civilization: "Build a civilization that will stand the test of time.") However, the idea (at least in my experience) is by far the easiest part. You can get inspiration in a matter of seconds. You can flesh out that idea into a rough story outline in a few minutes. But then, if you want to actually turn that story into a game? Well, that's where it gets hard. With that rough outline in mind, I started translating my concept into editor terms. I would have four maps covering the different geographic regions of the story. I would have five scenes, one for each map and a fifth scene that revisited an earlier one. I looked through the portrait gallery and list of NPC models and outfits to find the correct look for my most plot-critical NPCs. I'd be very curious to hear how other GMs have approached building their own content (which currently goes by the annoying monicker of UGC for User Generated Content), but my own process went like the following. I'd start building a map, just roughing out the geometry: laying down floors, streets, walls, and buildings. This will help define the route that the player will take (for a linear combat section), or the area that they will be crossing and re-visiting (for a legwork section). If there are any plot-critical items, I'll place them here. I then add my gameplay elements. I add the relevant NPCs, including enemies, allies, and quest-related characters. In conjunction with this, I'll add the dialogue. Due to a weird quirk of my brain, I find it really hard to write dialogue while staring at the conversation editor. Instead, I usually compose it in TextEdit or Google Docs while lying on the couch or riding on BART. Knowing in advance how the conversation editor works, I'll add little annotations in my document that breaks the speech into chunks, explains how they are linked together and/or loop back, and which checks and rewards are associated with each choice. So, when I'm back at my main computer, it's mostly a transcription process to translate the pre-written dialogue into my editor window. Once a certain scene is done, I'll move onto the next chronological scene, repeating steps 1-3. I'm not worried yet about combat yet, but this is my last good chance to make major changes to a map's layout or friendly NPC configuration. From this point on, making structural changes grows sharply more time-consuming. After the final scene is complete, I have a playable demo! Huzzah! This is a really, really good feeling. However, it's also very deceptive. At this point, I FEEL like the mission is about 90% complete. However, in reality, I've only spent about 30% of the time I'll invest in making this. As with other creative projects, it's the polishing that will make it good. I play through the mission a bunch. Is it fun? Does it make sense? How is the pacing? This is a crucial step. In the case of Antumbra, my original design document ended with a mission that was basically, "Kill all the enemies in the location." When I got to the point, I realized, "This is… really, really boring. The level before was way more fun, this just seems like a grind." So, I went back and largely redid it: I added in some puzzles to break up the monotony of fighting, and added a boss encounter at the end to give a more climactic feel. That boss wasn't even in my original script, so I had to write it up on the spot; but by this point I'd gotten a decent feel for the flow of the story, and was able to come up with something that seemed vaguely plausible and challenging. While Andrew was conducting his tests, I looped back to the first map and started polishing. My first phase of this focused on filling out the environment with more interesting elements. I added graffiti to walls, installed traffic lights, left out a dumpster, added some vagrants, put in tables, filled them with bottles of booze, put art up on the walls, built a recording studio, laid out offices for junior and senior executives, and so on. This was a different type of process, and actually a lot of fun; I've never played The Sims, but can see now why people would get into it. It's fun to sort of tell a story implicitly through the environment: "This guy is very useful to the business, but Kali doesn't like him personally, so he has a large office on the other side of the building from her." And, for example, I'd work with a "rich" set of props to fill Kali's office, but would only choose the pieces that would match her style and the rest of the decor. (Black lounge chairs and white coffee tables are good; beige armchairs are not.) At the same time, I'm also trying to make sure that everything looks all right. Sometimes you need to fiddle with props and the placement of objects in order for things to look right. This part is more tedious and time-consuming, and sometimes if I couldn't make it look right I'd just get rid of something entirely and replace it with something else. I then repeated this for the remaining maps, focusing on each one until I liked the look of it: richly detailed and unique without seeming overly fussy or overwhelming. Once all the maps were filled out, I did one final pass over all maps adding atmosphere. This involved choosing the lighting for the level, picking out the music to play, placing point lights strategically, and adding non-interactive NPCs to give more flavor to the scene. Placing point lights was one of the most frustrating aspects of the entire process, and required a lot of trial and error. By this time, I'd received initial feedback from Andrew, so I was able to start fixing bugs that he identified. I also sent him periodic updates as I finished polishing the levels. Once again, his encouragement was really helpful and kept me motivated to finish the time-consuming work of making each map look good. I'd been running my private beta testing on Steam Workshop. It's a little quirky, but you can publish your content, then quickly edit it to change its visibility to Friends Only. That gave me a really easy way to send builds to Andrew, and also keep track of what had changed since his previous version. (I use a public GitHub repo for my source control, so as long as I know when each build was created, I can easily construct change notes from my commit list.) Once Andrew suggested that the time was ripe to open it up to a larger audience, I flipped the switch from Private to Public, then nervously waited for folks to discover it. And, fortunately, it's been a pretty good reaction so far! I received some nice compliments about various aspects of the mission (with writing and map design seeming to be high points), and also some very useful constructive criticism. I was glad to not get any notes like, "This mission is no fun," but instead suggestions like adding an auto-save point before the final boss, notes on where certain details of my story didn't mesh well with the Shadowrun universe, and a single (!) typo report. So, anyways... it's probably implicit in all that text above, but I'll come out and say it: making something is hard work. This isn't unique to games, of course, but I think they're a good example of the incredibly long path from an idea to a completed work. For me, personally, it feels like it takes a fair amount of mental energy to continue working on something, and also a sense of optimism that the results will be worthwhile. I found myself thinking a lot about art and craft while building Antumbra. Many people automatically associate "arts & crafts" with gluing sequins to pieces of yarn in elementary school. As I see it, though, they're two different schools of tradition that together encompass almost every creative endeavor. An "art", historically, is creating something unique that has never existed before. This includes fine arts like painting, but also activities like writing a novel or composing music. A "craft", in contrast, focuses on making an existing thing very well. A blacksmith is a craftsman, but so is an orchestra conductor or a landscaper. Based on these working definitions, you can see that whether something is an art or a craft is not automatically determined by its medium; rather, it's determined by the process of its creation. I would argue that books like "The Raw Shark Texts" and "Kafka on the Shore" are examples of art: they feel wholly original, and seem to emerge fully formed into the world. On the other hand, books like the Nancy Drew series are examples of craft: while each particular story is different, they're all built using the same tools, and seek to achieve the same ends. So, with all that said, I think that the majority of games that are created today are mainly the result of craftsmanship, not art. There's a spark of inspiration that strikes at the beginning of any good game, and that originality is absolutely necessary for a game to be good. But, it is far from sufficient. Much as it pains me to admit, a well-crafted game following a derivative story will be far better than a poorly-executed game with an original idea. (In other words, I'm looking forward greatly to Grand Theft Auto V, and some of my greatest ire is reserved for games like Spore that failed to deliver on great potential. Of course, my favorite games combine unique concepts with great execution, like Rez, ICO, or System Shock 2). I think part of that is due to the multi-disciplinary aspect of modern game-making. In the early days of PC gaming, a single talented individual could conceive of a game and then create the entire thing. Today, particularly for the best-known games, a game requires the successful cooperation of hundreds of skilled craftspeople: 3D modelers, level designers, voiceover actors, programmers, sound effects engineers, and more. Sometimes a single strong visionary is able to place their stamp over the entire project, but in practice it usually ends up being a collaborative vision, which dilutes the originality but strengthens the project, as each discipline can claim ownership over an aspect of the finished work. Indie gaming is an obvious exception to this, with weird little independent creations like The Binding of Isaac arriving as strange and wholly self-contained experiences. In a way, mod projects are a kind of corollary as well. In a sense, much of the heavy lifting of craftsmanship has been lifted off of mod creators by the studio who created the game. The modder can then devote more of their time and energies to acts of artistry: dreaming up original stories. However, even then there's still an enormous amount of craftsmanship that is required to make your mod a reality: the sometimes-boring technical tasks of learning the best practices, applying them to your project, then studying the result and making adjustments until it feels fun. All right, it's time for my discursive, rambling thoughts about Shadowrun Returns! What a fun game. It really validated my trust in the Hare-Brained team, and is probably my best experience to date with a Kickstarter investment. The game itself is fun, nicely polished, and wonderfully evocative of the old Shadowrun feel while also creating plenty of surprises. It doesn't just exist within the lore; it enrichens it, answering at least one crucial mystery in the Shadowrun universe, and polishing the setting's style for modern times. I'd briefly touched on my initial impressions before, and for the most part they still hold, with a couple of corrections. Reactivity. Not quite as major as I'd initially thought. The game front-loads a few majorly consequential choices, but as you get further along it's increasingly focused on player reaction over player choice. It's still good, just not as strong as it first seemed. Writing. This gets a little sloppy later on. The first half or two-thirds of the game are very polished, with impeccable form; near the end (though fortunately not in the very end-game), there are some pretty noticeable typos and grammatical failings. It's very forgivable within the context of the entire game, though. Now, let's expand my old list with a new set of reactions. No spoilers, just yet. Oh, and in case you're curious, "Dead Man's Switch" is the name of the official campaign. For most players, this will be synonymous with Shadowrun Returns, but I've gotten in the habit of using it to describe the official mission's content in contrast with the engine as a whole. Focused Missions. It's more "Mass Effect 2" than "Mass Effect 1", if that makes sense. I know that some people will treat this as a negative, preferring the more open-world, free-roaming structure of the 90s games. But, personally, I strongly preferred this approach. There's a great sense of progress, and you're pretty much always advancing the main plot. No Grinding. Strongly connected to the previous point. In the earlier games, you would inevitably need to re-run a bunch of similar missions (Corporate Extraction, Matrix Hacking, etc.) in order to level up the nuyen and karma needed to tackle the next plot point. In Dead Man's Switch, everything is tuned very well: you'll gradually gain XP and nuyen in each story mission, giving you what you need to tackle the next step. 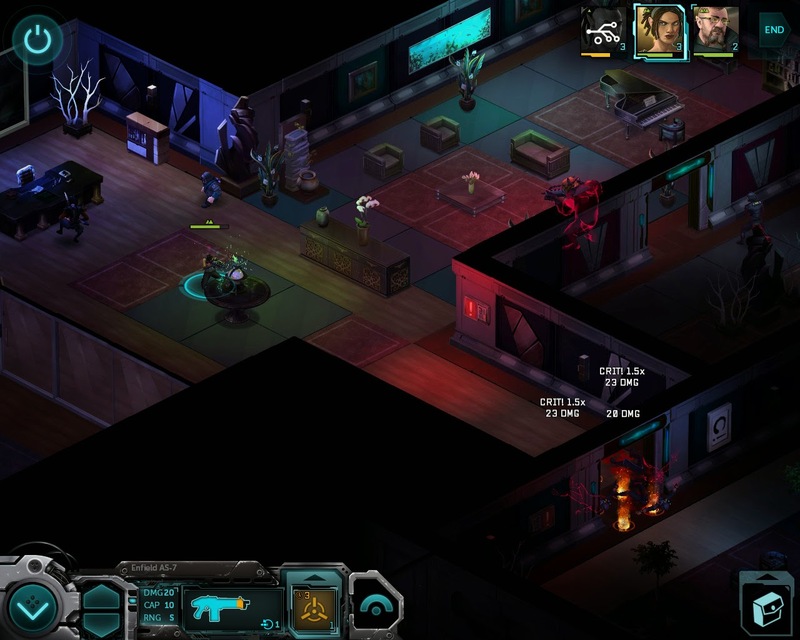 You'll only run a single "pure" shadowrun in this game, and it's a very fine-tuned, good-looking one. Story. More about this later, but I really enjoyed the plot. Team Composition. I had a fantastic time just playing with a limited set of classes, and already found some amazing synergies between seemingly disconnected archetypes. I hadn't initially thought that I'd ever re-play Dead Man's Switch, but I increasingly feel like it would be a lot of fun to experience some of the archetypes that I never tried, like Shamans, Physical Adepts, or Riggers. Difficulty. I completed the game on Hard mode, and found it nicely challenging without feeling frustrating. I generally ran a 3-person team, with myself (a Decker/ranged fighter), a support mage, and a street samurai. I played conservatively, cautiously advancing through areas, using Overwatch often, and keeping all my members buffed. Up until the last mission, I think I had to use Doc Wagon once. There is a major difficulty spike on the final mission, though; I got pretty far, but eventually needed to re-load an older game and put together a full 4-person team. Length. I've seen a lot of reports that DMS is a 12-hour campaign. According to Steam, I spent 20 hours on the game, which feels about right. I'm a very analytical player, so I spent a decent amount of time figuring out my build, reading through all the dialog, doing every side-quest, and so on. As noted above, I also had to re-play much of the final mission, though I probably lost less than an hour to that. I do feel confident, though, that a re-play of the game would take less than 12 hours, since you would know where the enemies are and could blow through the dialogue quickly. (Lack of) Documentation. The in-game help is pretty good, but glosses over the mechanics that underlie combat. Even after trawling through the wiki and other official and semi-official sources, I'm still very unclear on what seem like some pretty fundamental concepts. Like, what exactly does Armor do? I'm sure it protects you, but does it make you harder to hit, or decrease the damage you take on a hit? Is it effective against spells? Does cover work on a diagonal? How severe can the diagonal be? Does cover give a flat reduction in chance to hit, or a multiplicative reduction? I should point out that my lack-of-knowing doesn't materially hurt my ability to play and enjoy the game - it's clear that armor and cover are both good, even if the nature of their goodness remains a mystery - but the tactician in me would really like to understand how the underlying system works. Cyberware. Maybe not "bad", but "underwhelming". It feels very under-powered for how expensive it is. You can easily spend ¥2500 on something that only gives a +1 to Body, for example; in contrast, many Outfits give much better stats and only cost a few hundred nuyen. Add in the lost Essence from cyberware, and the fact that (unlike other items) you can't re-sell it, and I have a hard time justifying the purchase. Even though my PC was a Decker, and I'd been planning on loading him up with cyberware, I eventually decided that I got a lot more utility out of a single investment in Magic and a Heal spell than I would by loading out on Cyberware. Late in the game, I did try it out, buying a cyberleg and Wired Reflexes. Wired Reflexes was my favorite upgrade in both the SNES and Genesis games, but here, its stated benefits aren't that great, and even worse, it's very buggy. (The idea is that you can auto-dodge an attack with them; but it's a mode that needs to be activated, costing 1AP; and when it's active, you'll "dodge" friendly actions like beneficial spells cast on you. Bizarrely, you also "dodge" when you try to reload a gun, though at least you don't lose AP from this.) Anyways. Cyberware is one of the defining looks of Shadowrun, and it's a shame that the in-game offerings aren't more tempting. Healing. Not a big deal for most runs, but there are some quirks in the system. I generally healed via the "Heal" spell. You might expect this to heal a fixed number of health points, much like a medkit. Instead, it restores ALL the health that was lost via the LAST attack on this character. So, for example, if you get shot for 5 pts of damage, and then again for 18 pts of damage, Heal will restore 18 pts. On the other hand, if you get shot for 18 and then shot again for 5, only 5 will be restored. This can make combat very frustrating when multiple enemies shoot you on the same turn. (I think I get why they set it up this way - without that limitation, you could always re-heal to full health between encounters on the same run, which would probably make it overpowered. Still, I think the mechanics could have been finessed to make it more fun while keeping the tension.) On a graver note, before the final mission (which is by FAR the most difficult in the game), you can buy spells, and drone repair kits, and even install cyberware... but NOT medkits, for some bizarre reason. That final mission is the one place where I would have loved to load up on them. The moral of the story: as soon as you gain the access to buy Level 3 medkits, buy a couple more than you think you need and keep them in your Stash, so you can access them when they matter most. Next up, I'd like to chat a bit about my gameplay experiences. This mostly focuses on strategy and builds; it doesn't contain any plot spoilers, but if you enjoy figuring these things out yourself, you might want to skip for now. I played as K1r10n, a male elf. He was primarily a Decker, but I knew that Decking alone wouldn't be of any use in most combat, so I also devoted a fair amount to Quickness and Ranged Combat. I decided to specialize in Assault Rifles, figuring that I'd generally hang back from the front lines and do my damage from a distance. Altogether, I eventually put more Karma into Quickness/Ranged/Rifles than I did into Intelligence/Decking. I also invested a fair amount into Charisma, reasoning (correctly) that my main character would be leading all conversations, and therefore points invested here would help unlock new dialogue options. It's pretty similar to how I tend to invest in skills like Persuade in games that support them. I love the idea behind the Etiquette system, but for in-game purposes, it doesn't feel very balanced. For example, the "Security" etiquette shows up many times at the start of the game, and seems to give you a way to bypass some early puzzles. In contrast, something like "Academic" might only show up once or twice, late in the game, and only provide a bit of extra flavor text. I don't recall ever seeing "Gang" come up as an option at all. One of the great design ideas behind DMS is that your PC's skills will help speed solutions to certain problems, but will never lock you out of content. So, for example, if you have a high enough Decking skill you can get a necessary plot item out of Coyote's computer within a matter of seconds. If your skill is lower, you'll instead need to go on a conversation quest, talking with other NPCs and inputting answers into the computer. This involves more running around, but also lets you learn more about Coyote, so it doesn't really feel like punishment. When applied to Etiquettes, sometimes you get a similar easy-pass option. For example, Security checks are generally used to let you cross checkpoints more quickly; without it, you might spend an extra minute doing a mini-quest. Other times, an Etiquette can be used to expand a reward given from an NPC. Late in the game, if you turn some pay data over to a fence, he might offer you ¥1500 for it. If you have the Society etiquette, though, you might recognize the names on the list, and be able to demand ¥2000. So, there's a direct in-game benefit from having the right Etiquettes, but it doesn't confer an overwhelming advantage. Incidentally, I think this is an area that might pose a big challenge to campaign creators. Using etiquettes is a great role-playing tool, but it's expensive and time-consuming to create enough situations where each of them will feel useful. It'll be interesting to see if people go to great efforts to incorporate them, or only add a few for flavor (not worrying about balance), or just ignore them altogether. Late in the game, as my main stats started getting very expensive to upgrade, I began investing a couple of points into Body and Dodge. I actually pretty much never died, so Body wasn't essential, but it did give some extra insurance. Much like Baldur's Gate and similar games, if one of your companions dies you have a chance to resurrect them (via a Doc Wagon pack), but if your PC dies the game instantly ends. So, it's worthwhile to err on the side of caution. Likewise, Dodge seems useful, though I still don't totally understand just how effective it is (how it stacks with cover, whether it protects against magic/AOE, etc.). Oh, and as noted above, I even put a couple of points into Magic just so I could cast Heal. I almost never needed it, but it's useful to have on hand. Combat strategies will vary a lot depending on your team. In my case, once I got to the point where I could hire runners, I pretty much always brought along Alexander Falk, who is a fantastic support mage. I would also take along Coyote if she was available; she shows up for free on some missions, for a really cheap ¥1000 on others, and doesn't appear at all on more, so I'm not totally sure what her deal is. When she was gone, I'd pick up another Street Samurai, preferably one with a shotgun. Incidentally, I'm not sure of this, but it looks like the game might keep track of what runners you've hired, and give you discounts if you re-hire the same ones later. When I first picked up Falk, I think he cost around ¥1000, about the same as the other Nephilim runners. Later on, his skills had improved, but he was still available for just around ¥1500, while other runners with worse skills were asking for ¥3000. I'm not sure what the mechanics around this are, but I really like the idea that runners are paying attention to how successful your runs are, and giving you a discount if they like/trust you. Anyways. At the start of combat on a typical run, I'll first have Alexander buff us all. I generally cast Haste on K1r10n, since, as my main runner, he does more damage-per-turn than anyone else. (If I had another runner who was stronger, I'd cast it on them as well). Between the rest of this turn and the second one, Alexander will also be able to cast Armor and Aim on the two main team members. From then on, his main job is to keep up those three buffs. In between, he will either catch up to them, or buff himself, or (rarely) attack enemies with his spell. I absolutely adore how tactical the game is. You'll generally be advancing further into the fog of war, trying to anticipate where your enemy will come from; however, sometimes you'll be ambushed from the side or behind, so it's important to watch your six as well. Many maps will include chokepoints, typically a door or a narrow corridor, and if you're able to take advantage of it, you can triumph over a much larger group of enemies. One of my favorite tactics was to use Alexander's spell to create 5 squares of fire, which can easily block off a doorway. Enemies can still walk through it, but they'll take 10 damage from each square. Meanwhile, one or both of my shooters can keep Overwatch from the other side of the entryway; if I'm lucky, anyone who crosses through will take initial damage from the fire, then trigger an auto-shot from my defenders, and die before they can even get off their first shot. It isn't immediately obvious, but boosts in this game seem to be additive, not multiplicative. So, while a 15% boost to hit from the Aim spell might not sound like much, in practice it can take you from a 50% chance to hit up to a 65% chance, which is great. I never took any shots if I was less than 50% chance to hit. I usually tried to conserve my cooldown shots like aimed shots for situations where I needed them. Within a given turn, I would try to plan ahead and think of where I wanted to be by the end of that turn. Depending on my position and the enemy's, I might fire off a shot and then duck into cover, or move into cover and then fire a shot. It would sometimes make sense to take a single action from one character, then switch to a second character for one action, then back to my first for a final movement. This was particularly true if, for example, I wasn't sure whether I would be able to take down a particular enemy by the end of the round or not. Weapon-wise, I was very happy with my Rifle. The base attack has very good accuracy and damage at any range. Once my skill got high enough, Full Auto became a very viable attack, particularly at close range but even at mid-distances. All of the special attacks have good use, though... an aimed shot can let you hit something on the other side of the map at 99% accuracy, and the two-shot attack is fantastic to keep in Overwatch if you have the AP to spare at the end of your turn. Other than that, I most dug my fellow runners' shotguns. It's more accurate at range than I would have expected, does a nice spread (with the right upgrades/special attacks, you can even get spread at close range), and packs a good punch. Pistols and SMGs are fine, but seemed lacking compared to the other two. Which is fine - they're also cheaper weapons, so it makes sense that they would carry a bit less power. My absolute favorite encounters were the ones where K1r10n would jack into the matrix, and then the other two runners would need to protect his meat body while he did battle against ICE and enemy Deckers in cyberspace. The first of these may have been the best - you're invading a BTL system, and combatting an enemy decker who you can actually see in meatspace at his own jack terminal. Meanwhile, he's controlling chipheads that are attacking your runners, and... well, it's all really awesome. If and when I re-play the main campaign, I think I'd like to try a shaman. I didn't have any experience with them in this game (apart from a scripted encounter with a summoned spirit), but they seem to have some interesting mechanics. Of course, I also want to try playing as a rigger, and a physical adept, so... we'll see how it goes! I'd ordinarily drop into Mega Spoiler territory here to discuss the plot, but I actually put a lot of that stuff on my screenshot album, so I won't repeat myself here. Check it out if you love spoilers! After wrapping up Dead Man's Switch, I tried a couple of other user-generated campaigns (UGCs). 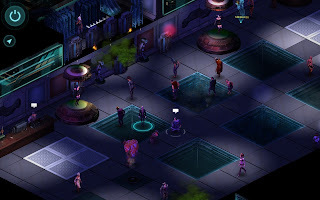 The biggest and best-known so far is Life on a Limb, which is the first major release from the ambitious Shadowrun Identity project (a huge set of interlocking stories set in a shared universe). It's pretty impressive, and a great example of what the Shadowrun engine is technically capable of: it has a huge open area, with tons of actors, tons of interactive objects, lots of dialogue, and so on. Personally, I felt a bit overwhelmed by the whole thing. I had really loved DMS's focused drive: there was variation in how you could accomplish your goals, but you always had a clear objective in mind, and a strong sense of propulsion to your plot. In contrast, LoaL drops you in the middle of things (after an initial encounter on a bus), and it's very challenging to figure out exactly what to do next. I do think that this sort of open-world, exploration-based game could be a lot of fun, but it will take more polishing and tuning to become really fun. The other one I've tried so far is the SNES Reboot. This is still in an early alpha state, and is appropriately flagged with warnings about its bugs. Considering how early it is, though, I was very impressed at what a good job they've done so far. I got serious nostalgia at numerous points throughout my short playtime: waking up in the morgue, scaring the attendants, letting out Dog, spotting a sniper in the grass. One interesting question that they'll need to address at some point, though, is how closely they should faithfully adhere to the original SNES mechanics, and how much they want to update/improve it for modern times. I loved the original, but it required a lot of grinding. Similarly, there's a lot of potential to update aspects in the original that were lacking, like the Matrix. Anyways! This is one of the projects I'm most excited about at the moment. That said, there's huge potential for a large number of even better campaigns to start arriving in the next couple of months. Next to the Kickstarter story, the thing that is collecting the most interest about SRR is the powerful editor it ships with. I've played around with it a little, and am very impressed by it: I'd initially been skeptical that it would be usable without a scripting language, but in practice, their node-based system for manipulating conversations and triggers works perfectly fine, and is certainly far less error-prone than a script would be. The editor also integrates a mapping tool, which is a lot of fun to play around with: it's a bit akin to building something out of Legos, and features a truly staggering array of items to place in your game. Like Harebrained Schemes said, the editor they've shipped is exactly the same one they used to build DMS, so literally anything that can be done in the main campaign can also be done in our own scenarios. You can hack cameras to gain line-of-sight into the fog of war. You can set up a three-way battle between mutually hostile factions. You can disguise yourself. There's rain, and cut-scenes, and puzzles, and all sorts of nifty things that you might not initially think were possible. Most amazingly of all, SRR essentially ships with the complete source code to DMS, so if you ever wonder "How did they do X in the game?" you can just load up that scene and find out for yourself. With tools like this, I'm very eager to see what a legion of passionate fans can create. I've lurked a bit on the Shadowrun editor forums and wikis, and have been really impressed at what motivated modders have already figured out. The editor is powerful, but still seems to have some limits: for example, you can add custom portrait packs to your campaign, but there doesn't seem to be a good way to add custom 3D actor models. However, there's lots of other stuff that was thought to be impossible (in some cases because HBS said "that's impossible") that modders have recently achieved. People have figured out how to create random encounters, how to build random maps, how to make respawning enemies, how to create new weapons, how to implement a manual save system, how to import your own props and textures, and so on. I'm frankly pretty stunned. So, there you have it! If you're at all interested in the Shadowrun setting, turn-based combat, and/or RPGs, I think Shadowrun Returns is totally worth the $20 investment. The main campaign itself is nicely tight and exciting, and for people who want to spend more time with their character, there's a growing body of user-generated modules to continue your adventures. Highly recommended. Wired Reflexes no longer dodges friendly effects. Load times have been reduced after version updates. Also, it sounds like guns have been rebalanced: in particular, shotguns are a lot less powerful, and SMGs more useful. I'm happy to hear about the bugfixes, and the balance changes sound reasonable.